I have a scarf and a half left to go and I'm officially done for this year. I have thoroughly enjoyed this year-long crochet project and am casting my eye about for what I will do next year. I've already decided to finish the stack of magazines on the ottoman and then we'll look at whether it will be crochet or cross-stitch that we jump into head first with January 2014. Football is great for crafting. I can have it on but I don't have to give it my attention, unlike a movie. I get quite a bit crocheted while I am "watching" a football game. Yesterday was the last regular season football game for Iowa. Now we wait a couple weeks to find out which bowl game wants to give us a bazillion dollars to have the Hawkeye faithful come, en masse, and pump billions into the local economy. It's well-known that when you invite Iowa to a bowl game, the fans come too, lots of fans, lots and lots of fans. We're kind of nutty that way. Anyway, we played Nebraska. In the past two years, it's not been much of a game. I've been able to watch it on TV, but have been slightly embarrassed by Iowa's lack of competitiveness. Plus, I think this is a manufactured rivalry. If it was Iowa State and Nebraska, yeah. They were in the Big 12 conference together for decades. But then Nebraska came to the Big 10 and the powers that be needed something to hype. They came up with a trophy they had the fans name. It's called the "Hero Trophy". Maybe, in 50 years, it will mean something, but right now, it's a silver football on a pedestal. Sorry Big 10. It has no flavor of "Floyd of Rosedale". All it represents is the last game of the year for both teams. 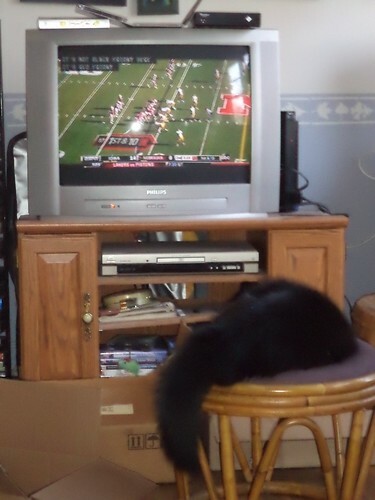 For me, it was a chance to watch the Hawkeyes on TV, something that's rare around here unless I get cable. I put my feet up in the recliner, pulled my current scarf project into my lap and worked on that. But it's kind of hard to be devoted solely to the game or to the project at hand when you get a seat mate. 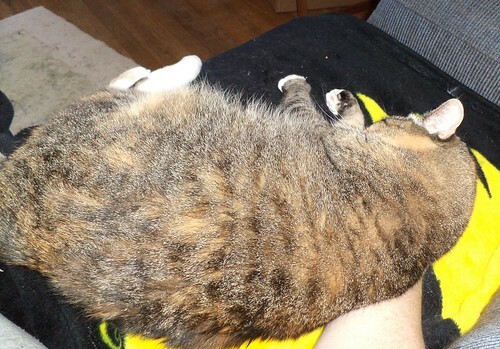 All I have to do is put my hand on the recliner and she flops down on top of it to get chin and ear scratches. You can't hear the loud purring. She is one contented cat. Pilchard sat in my lap for a time, but Iowa played a stellar game. After the third or fourth cheer from me, which frightened both of them, Pilchard got off the lap and went to the footrest. She stayed there through the rest of the game. Mija would startle and run away, coming back when I called to her. But, by the end of the first half, she decided I was way too noisy for her liking. She spent the rest of the game on my bed. Iowa wound up beating Nebraska soundly and I got most of the next to last scarf done. Now, tomorrow, I will select a game, pick up my crochet hook and work on finishing this current scarf so I can start on the last one to be completed. I probably won't know the score of tomorrow's game because I have it on strictly for the background noise. As much as I don't care about pro football, it does have the one use as noise for crocheting.